After our yummy breakfast, we headed out and made our way to the Lower Town to visit the Museum of Civilization. We arrived a few minutes before a free guided tour was set to commence, so we picked up some headsets and gathered with the other tour participants. Our guide led us through the temporary exhibit: Masters of Olympus: Treasures of the Greco-Roman Collections of Berlin. This was not a very large exhibit and the artifacts were displayed in a very modern, clean way. We were thankful that we wore headphones while our guide spoke into a headset as there was construction going on around the museum and the sound of jackhammers and saws was juuust a bit loud. The tour lasted about 45 minutes and was really a nice history lesson on Greek and Roman mythology. I had to keep reminding myself that these stories I was hearing were not actual fact but myth. It was all very interesting, and let me just say that I’m glad I’m not a Greek or Roman god – that is one dysfunctional family! 😛 Most of the artifacts we saw dated back several centuries before Christ which I still find so amazing. After the tour, we next visited the Free Spirits Exhibition which was a room filled with folk art. Very….interesting. From there we walked through an exhibit of Pierre Gauvreau’s artwork – a 20th century Quebec artist; This Is Our Story: First Nations and Intuit in the 21st Century – a new, permanent exhibit about the aboriginals of Canada; and People of Quebec…Then and Now – an exhibit containing many items relating to the history of Quebec, dating from the 1600’s to today. At this point we were pretty hungry so we left the museum and walked to Place Royale where we settled on pizza at La Pizz. Our Greek pizza took quite awhile to make it out to our table but it was very worth the wait! 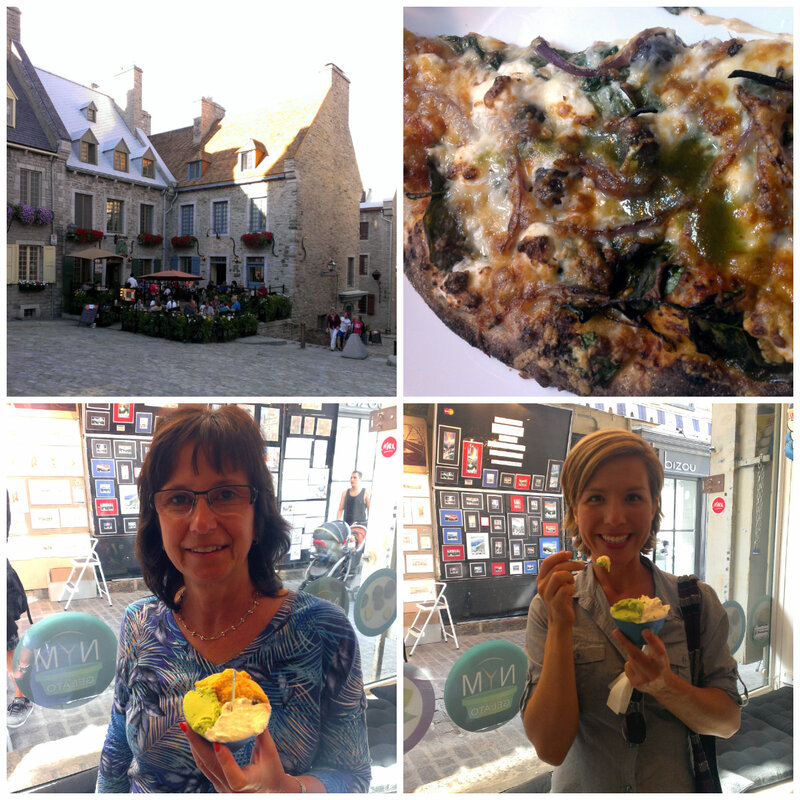 After finishing the last crumb, we headed back up to the Old Town and and picked up some gelato at a gelateria near the Notre Dame Cathedral. After running into a few souvenir shops, we made our way back to our apartment to freshen up for our final evening in Quebec. We had made dinner reservations the previous day at eChaude, a wonderful restaurant located in the Lower Town of the city. We could not have picked a more perfect restaurant to cap off a wonderful two weeks in Canada! Although we had initially planned on sharing an appetizer and dessert, after looking at all of the amazing-sounding choices on the menu, we decided to each order our meal as table d’hote. I started with a most delicious Cucumber Gazpacho with Fennel Sorbet and Smoked Trout (hello, most amazing thing I’ve ever put in my mouth!) and Georgann started with a Lobster Salad with Green Asparagus, Fresh Strawberries and Pistachios. No words other than sooooo good!!! For my entree, I ordered something I rarely order anymore: steak. 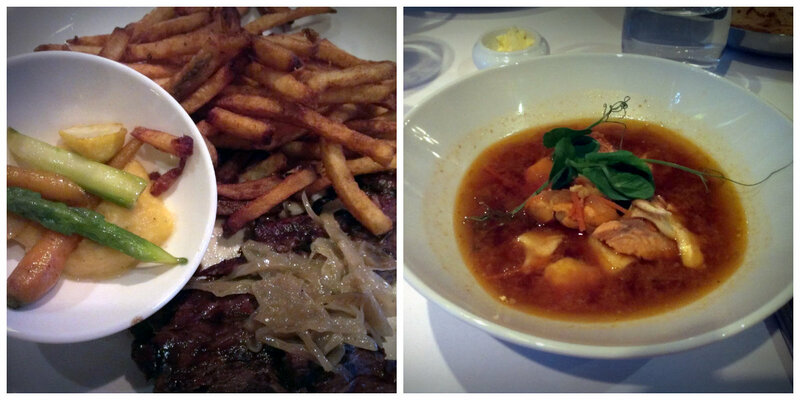 Specifically, Beef Flank Steak with Shallot Butter served with fries and veggies. Georgann enjoyed Fish and Mussel Soup in a Lobster Court-Boullion. Dessert consisted of Creme Brulee with Madagascar Bourbon Vanilla (me) and Creamy Chocolate with Spices and Port and Fig Ice Cream (Georgann). Both: marvelous. We thoroughly enjoyed our two-and-a-half hour meal that was filled with incredible food and lovely conversation! 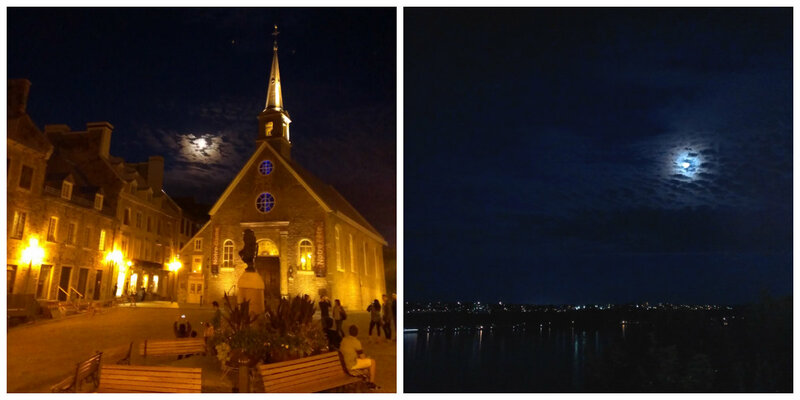 We were blessed with some beautiful moon-filled views on the walk back to our apartment. I’ve now visited the country of Canada twice. And I must say that I’m just as much in love with this land after my second visit as I was after my first. I plan on exploring as much of this beautiful country as I can in the coming years! The Museum of Civilization is a smaller museum located in the Lower Town and a day is more than enough time to explore the exhibits. It is open Tuesday-Sunday and entrance is $10 CAD for adults. The various guided tours are included in the entrance fee. If you are in Quebec and looking for a really nice place to dine – eChaude fits the bill! The restaurant building itself is very unique and has both indoor and outdoor seating. Although at first we thought our server was going to be less than the most pleasant person to deal with, he ended up being fantastic! We both really liked him and he helped make our meal more memorable. The food is amazing, the atmosphere is distinctive, and the service (at least ours) is first-rate. Highly recommend!